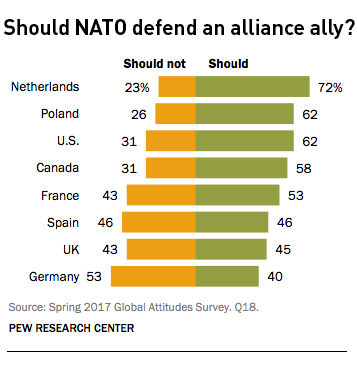 As President Donald Trump prepares to fly to Thursday’s NATO summit in Brussels, he and his 27 counterparts should look at a new poll of public attitudes on both sides of the Atlantic about their alliance, and about the threat posed by Russia. What’s more, majorities or pluralities in all but one country think NATO should come to the defense of a member that gets into a serious military conflict with Russia, and that their own country should take part. These findings are remarkable given that both polls, taken in springtime 2016 and 2017, occurred during an American presidential campaign that saw candidate Donald Trump frequently deriding NATO as “obsolete” and as strong populist movements were driving the Brexit campaign in the United Kingdom and presidential campaigns in the Netherlands and France. Nationalistic, anti-alliance rhetoric was a staple in all four countries between spring 2016 and spring 2017. 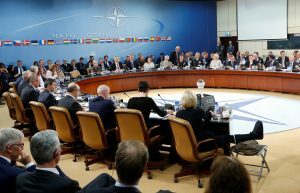 Yet over that year, NATO’s favorability rose 9 points in the U.S. (from 53 percent to 62 percent), 11 points in Britain (from 51 percent to 62 percent), 11 points in France (from 49 percent to 60 percent), and seven points in the Netherlands (from 72 percent to 79 percent). The big unknown is, if the U.S. and its allies are put to the test, will President Trump take up that challenge? What’s driving this stronger solidarity? All arrows point to growing trepidation about Russia, which invaded and annexed Crimea in 2014, is now supporting a rebellion in Eastern Ukraine and tried to manipulate elections in the U.S. and several European countries. Russia is viewed as a threat in all countries surveyed (except Spain) by huge majorities of 77 percent to 91 percent. Yet there are warning signs for NATO too. A majority in Germany — with the fourth largest military in Europe — would not support coming to the aid of a NATO partner in a military conflict with Russia. 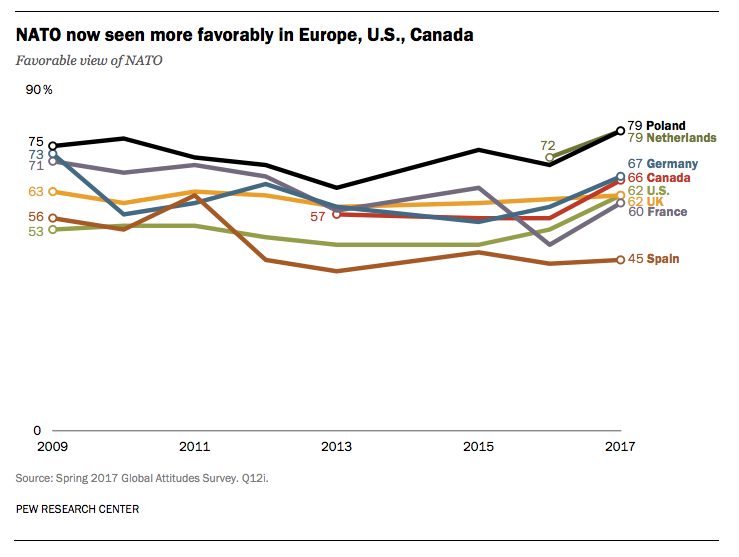 And in the U.S., feelings about NATO have become deeply polarized. Some 81 percent of self-professed “liberals” support the alliance, but only 48 percent of “conservatives” do, no doubt reflecting the fallout from the Russia election meddling controversy. Another warning sign: support for defending a NATO ally against Russia is much higher among Americans over 50 than in the under-30 group. Since becoming president, Mr. Trump has shifted his rhetoric about NATO, saying he supports the alliance while still calling on other countries to spend more on defense. But his earlier anti-NATO rhetoric clearly has had an effect on Europeans’ confidence in America’s backing. A majority of Europeans polled believe the United States would ride to any NATO member’s defense in conflict with Russia. But those majorities are lower than they were in 2015.